Liverpool extended their unbeaten Premier League run to a dozen games with a 2-0 victory over Fulham at Anfield. Goals in either half by Mohamed Salah and Xherdan Shaqiri settled the lunchtime contest and consolidated the Reds’ excellent form in the division. Liverpool continue to maintain their best pace in the Premier League era. Sunday’s victory increased their points tally to 30 so far this term – nine wins and three draws – which equals their highest total after the opening 12 games of a campaign. Never before have the Reds had as large a goal difference as +18 at this stage of the season, while their defensive record of just five conceded is their lowest by the same measurement. A first half that Fulham had edged in terms of genuine threats at goal was ultimately punctuated by a dramatic, 14-second passage of play in the 41st minute. As the celebrations prompted by Aleksandar Mitrovic’s headed finish at the Kop end transformed to disappointment due to a raised offside flag, the Reds had already restarted play. Alisson Becker’s quick thinking teed up Trent Alexander-Arnold to thread a pass around the visitors’ defence for Salah to scamper away – and the No.11 emphatically buried the ball past Sergio Rico. 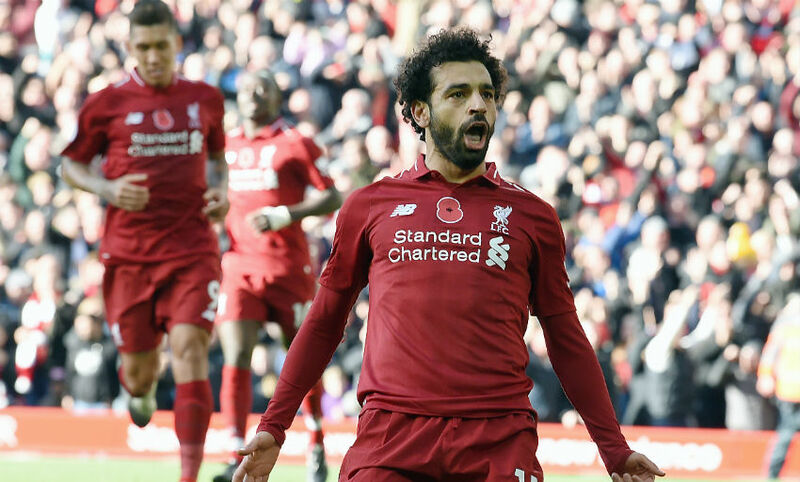 It was the Egyptian’s eighth strike of the season and moved him clear at the top of the Liverpool scoring chart so far in 2018-19, one ahead of fellow forward Sadio Mane. Salah has now netted against 19 of the 21 different teams he has faced in the Premier League since joining the club; only Manchester United and Swansea City have denied him. 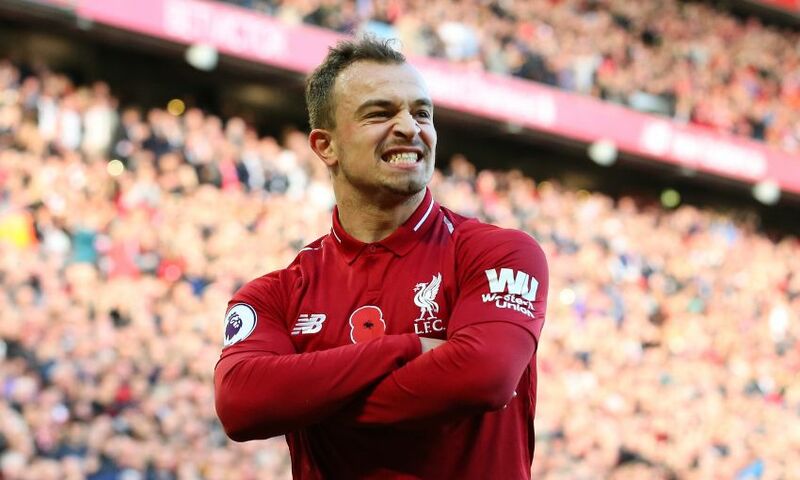 Restored to the starting XI, Switzerland international Shaqiri’s finesse on the ball had been evident in flashes during a tight first half at Anfield. But his most exquisite touch came eight minutes into the second period. Liverpool recycled a cleared corner back to Andy Robertson on the left flank and when his deep cross found Shaqiri unmarked at the back post, the attacker delicately volleyed a finish across goal to establish daylight between the teams on the scoreboard. The summer signing has scored or assisted in five of his last six Reds appearances in all competitions (two goals, three assists). Details of a pre-arranged assist competition between Alexander-Arnold and Robertson emerged earlier this season, with the full-backs eager for some healthy and friendly competition. As described, both added one to their campaign total on the afternoon, Alexander-Arnold creating the first goal for Salah and Robertson the second for Shaqiri. The Opta statistics suggest using the pair as a supply line was a tactic from Jürgen Klopp as they played a combined total of four key passes, 80 passes in the opposition half and 16 crosses. By our reckoning, it’s the Scot leading the Englishman as it stands – five to two. The final international break of 2018 follows this game, with Liverpool not in action again until November 24 when they journey to Watford in the Premier League. That trip to Vicarage Road marks the beginning of what may be the club’s most intense run of fixtures in the entire season. Klopp’s men will play 11 matches in 40 days in the English top flight and Champions League, culminating in an away clash with Manchester City.